Part 2 of this blog can be found here. I awoke on 4th August after a better night’s sleep – but not a great one. Breakfast was at a late 8am – it was also not great today so I raided some of the food left over from my lunch supplies. Today we were to descend back down to Darband and then drive 50 plus miles to Damavand. It was another beautiful day with barely any smog. A group of giddy Iranian women were making some noise in the courtyard. They had obviously had a relatively early start from Darband and had brewed some tea in the sunshine, and were off to Tochal. It would be impressive if they made it given the total 2,200m (7,200ft) height gain, let alone possible altitude effects. As is necessary in Iran, their walking gear was loose fitting and most had head scarves, though a couple were a bit more rebellious and just had baseball caps with hair tied back. Their giggling could even be heard drifting across the still air as they set off up the zig zags. We ourselves left Shirpala around 9am. The descent through the roped section was easier than I had anticipated. When we reached the outskirts of the village we took a higher route and so did not pass the restaurants again. I do not know why this was done as it was less interesting. But we did now have a look at a chairlift that follows the gorge. But eventually we ended up by the statue. A few from the group made a beeline for an ice cream parlour. It was hot, hot, hot – probably around 35C-38C. I just glugged some water. My innards were feeling better but I did not want to risk the ice cream. A nice large modern people carrier was waiting for us. And the bags we had left behind at Kassa Tours had already been loaded. There were seats for 12, though three of these had been taken up with boxes of food and cooking equipment. Our two junior guides were dropped off separately in Tehran. The driver fought our way out of Tehran. It was so hot that Mehti decided that a traditional Iranian cold dish was called for. The vehicle was stopped at the side of the busy road and he returned a short while later with Persian ice cream sitting in faludeh. It was rude to refuse. Faludeh is a frozen syrup with vermicelli noodles and flavoured with rose water. It was quite nice, different. Though I did not manage all of the vermicelli as they were a bit starchy. 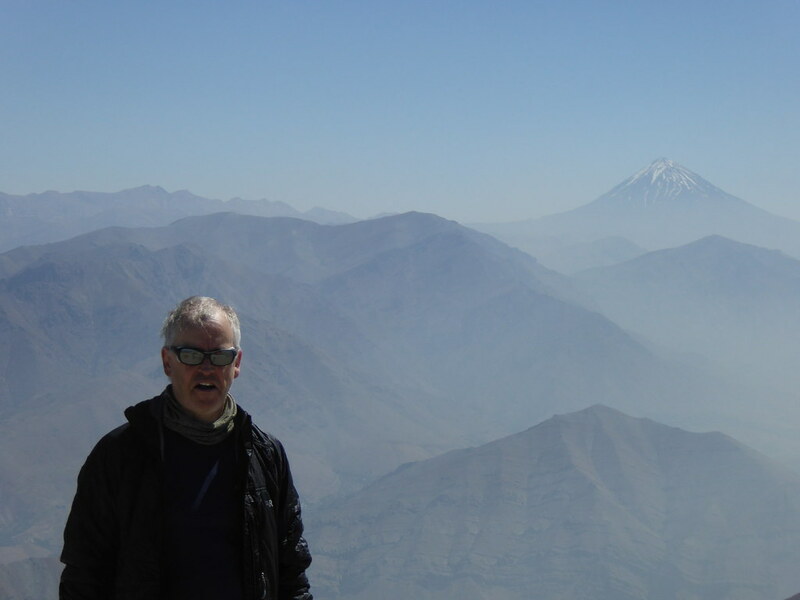 At about 2pm we arrived in the town of Polour, which is the nearest town to Damavand. The restaurant we were to visit was on the opposite side of the road. So our driver decided to make a U-turn in the four lane highway. As he straddled the road (the outside lanes in each direction) we heard a squeal of tyres as a car that was coming from the direction we had realised there was a blockage. I steeled myself for the impact. Fortunately it never came. That excitement over, we pulled up outside the restaurant and went in. We were shown to a long table by the entrance. A dirty window at the back gave us a view of Damavand. It looked gloomy up there. A veritable feast was presented to us with lamb and chicken kebabs, flat bread, pickles, salad, yoghurt, garlic, eggplant and saffron rice. Drinks comprised carbonated drinks and doogh. Doogh is a traditional yoghurt based drink with water, salt and mint. To my taste it was both odd and quite nice! From there we were driven a short distance to “base camp”. It is perhaps now worth explaining that there are routes up all sides of Damavand. We would be taken up the most popular, south side. On this side there is base camp, camp 1 and camp 2. Base camp comprises a large building at 2,200m (the Polour Camp) run by the Iranian Mountaineering and Sport Climbing Federation. It is not a base camp in the traditional sense. It is a large 3 storey building with a number of dormitories, cooking facilities, a climbing wall, offices and an indoor sports hall. Indeed you can barely even see the mountain from there. We would stop here on our return. But for now we would swap our people carrier for more robust vehicles that would take us and our gear to camp 1. The place was busy with climbers celebrating a successful climb and others, like us, preparing to go up. We had a bit of a wait and I spent some time talking to a dentist from Shiraz. He had summited the day before. He seemed keen to move to Europe to practice and the UK would be his favoured destination. He peppered me with questions about visas and life generally in the UK. It was quite interesting to see how many people were able to speak quite good English, especially when they had never had the opportunity to go abroad. In the case of this guy, his degree had been in engineering and English was required for this degree. We had to leave and I said goodbye. Our vehicles were packed. And we set off in our 4WDs. One was a Jeep Wagoneer, a car that we had used on Orizaba in Mexico last year. They are great cars for rough roads/tracks. But I was in the other car witih Phil and the guides! Having lost our two young guides we were joined here by Majid, an Iraqi Kurd who had moved to Iran at the time of the Iran-Iraq war and who spoke with a thick accent. Mehti seemed to regard him as a bit of a super hero. Majid was married, his wife also being a climber, with a two year old son. Majid had climbed on big, cold mountains and had lost a number of toes in doing so. After an initial 15/20 minutes on tarmac we turned off on to a track and had a bumpy 45 minute ride up to camp 1 at 3,200m (9,000ft) passing shepherds with their flocks and guard dogs. Camp 1 is called Goosfand Sar and we would stay here the night. I was slightly concerned about this camp because my research before going to Iran suggested that this camp was crowded, noisy and dirty. As it happens, I did not think that it was too bad. It even comes with its own mosque. Our accommodation was to be a converted stable. Here we are making ourselves at home. And here is a short video clip showing the surroundings. As we festered at one end of the building – reading, snoozing or listening to music – our guides prepared and cooked our meal over gas stoves. All day I had been cursing the fact that I seemed to have lost my buff. This had been a life saver in South America, especially once I had developed my throat problems. I had searched high and low for it in the hut on Tochal, looking around my bunk and emptying my rucksack at least twice. 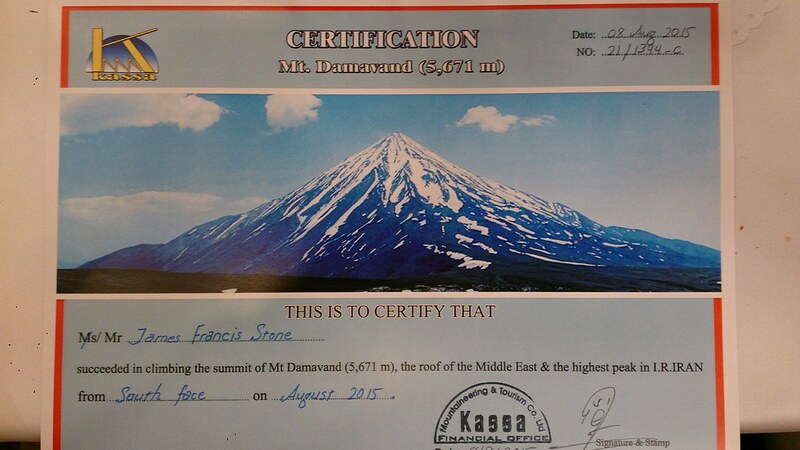 I was depending on it being available for the higher altitudes on Damavand. But it was nowhere to be found. For dinner we were having chicken in batter plus sliced roast potatoes and salad. A table cloth was laid on the floor and we sat cross-legged around it. I found myself a roof support to lean against. Although I was now regretting again the ice cream I had had earlier in the day, I ate enough. So we were now set for our attempt on the highest volcano in Asia. Tomorrow we would ascend to camp 2, the day after we would go on an acclimatisation walk to 5,200m or so and the following day we would make the summit attempt. Before turning in I went outside to have one last look at the view. 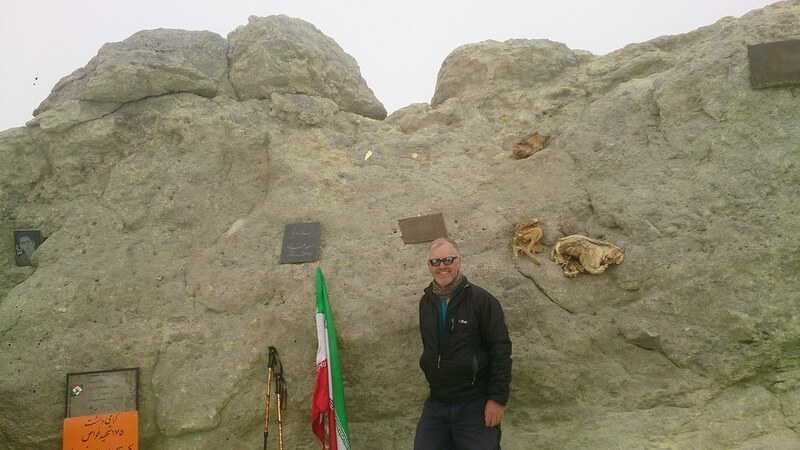 In my next blog (which can be found here) I will tell the story of my time on the upper reaches of Mount Damavand. I had not slept so well in ages. 10 hours solid, I must have been tired. Yde and I went down to breakfast. We did not see any of the others as we tucked into cucumber, tomato, pastries and orange juice. I ignored the other savoury items. We then packed up our final things and met the rest of the group in reception. Soon we were squeezing into a too small people carrier, gear stuffed in the back and lying in the aisle. We had two additional young guides join us at this point. First stop was the offices of Kassa Tours, our in-country agency. We left spare kit here, so that would leave more room in the vehicle. Before we left we had a briefing about the days ahead plus some teas/coffees/water. It was hot outside and it was before 10am. I could feel the sun burning through my thin top. We left and drove on for 10 minutes and stopped again to collect our food for the next few days – 3 large ziplock bags with a mix of fruit, nuts, sweets, biscuits and a couple of wraps plus a small plastic bottle each of Coke and Pepsi. I had filled my water bottles in the hotel, I was told that was OK but my tummy felt odd – but this could have been something I had eaten. Finally we drove north and battled our way through the Tehran traffic. Today we could see the indistinct shape of the mountains rising to the north, their orange-brown colour merging with what smog there was. We slowly made progress, dodging motorcycles coming the wrong way down one way streets and pedestrians who had no option but to risk life and limb to cross the jammed roads. Eventually we came to the end of the road at Darband, a northern suburb of the Tehran conurbation. Darband means “gateway to the mountain” because it is the start of the most popular trail up Mount Tochal which rises above Tehran. Mount Tochal is 3,964m (13,005ft) high. Its ascent would take two days and was part of our acclimatisation for Mount Damavand. On the first day we would ascend to the Shirpala shelter at about 2,700m (8,800ft) and attempt the summit the following day. Darban is quite a cosmopolitan place. A square at the beginning of the trail has a statue of a mountaineer. A few last minute kit adjustments and we were off at just after 11am but not before Mehti had insisted on taking some video of us by the statue. The trail follows a gorge with an attendant stream, switching sides from time to time. The way is lined with restaurants and kiosks selling drinks and the usual tourist stuff. It reminded me of the path up to the cave temples on Elephanta Island in Mumbai harbour. To counter the heat some of the restaurants have seats in the stream bed. At first the trail is narrow but motorable. It is then narrow and cobbled. As the eateries thin out the trail becomes a dirt trail. And the numbers of people also thin out. It was warm and became even more so as we left the shelter of the trees. After an hour we found some shade to stop in and I had a drink and a snack. Gradually the view opened up. Here is a first glimpse back to Tehran and a zoom from the same point taken after about 80 minutes. And the way ahead (which followed the obvious gulley line). As the terrain became steeper the path was graded. We passed the occasional sign which purported to tell us what altitude we had reached. It no doubt told us other things but we could not understand them! As far as altitude was concerned we learned not to trust them because we might be going few a few minutes and the next sign would claim that we had gained height that was simply implausible. It became hot. We stopped again after a further 45 minutes. We looked for any shade we could find. By now Arrvind and Neil were slower than the rest of us. So we waited for them to catch up. Then we were off again. The terrain becomes much rougher and aid has been installed. It is a shame really because a good old scramble would have been fun. So we had rope slung between metal posts (some of which were loose), steps laid on or cut into the rock and even a couple of sets of stairs. All the while views back to the city were opening up – albeit with a smoggy perspective. After 3 hours we emerged from a small piece of woodland and looked up to see the Shirpala shelter. This was quite a construction, built in the early 1970’s by the Iranian Mountaineering Federation. It would be our home for two nights. A substantial stone built building, it was about 4 storeys high. Inside there was a common room, restaurant, dormitories, toilets and a mosque. We were too early as the dormitories had not been opened up. So we spent some time on a nice open area looking back the way we had come. And an Iranian flag cracked in the stiff breeze. Here is zoom towards the Milad Tower, the highest structure in Iran at 435m (1,427ft) high. It is also the 6th tallest tower in the world. We were allocated a dormitory, but the Germans had got their towels sleeping bags down first, so we had to move. Never mind it was cosy enough. We festered until 6pm when dinner was served in the restaurant. Or at least Persian time meant that it arrived at around 6.30pm. The large German group was there. They had posh plates and metal cutlery. We had paper plates and plastic cutlery! The food was good though – salad followed by a noodle soup and then chicken nuggets (! ), gherkins, olives and some flatbread. My tummy was still feeling a bit odd. I bought some bottled water to reduce the risk of any bother! The toilets were the proverbial ceramically surrounded hole in the ground, typical of the middle-east and beyond. The following morning the Germans were off before us. But we never saw them again, not because they were fast but because they did not climb the mountain. “Sleep” had been horrid. Even with the window open it was hot. I was just in my sleeping bag liner and did not need the thick blanket. Others’ snoring did not help. Neither did the mobile phones that were left switched on so that various electronic noises occasionally permeated the darkness. This included an alarm that went off at 1.10am. Hmm. The proper alarm went off at 5.30am for a 6am breakfast. “Urgh” was my contribution to the breakfast conversation. We left at 7.05am. The path began up some steep manmade zig zags. Once the initial skyline was reached, the path remained clear and the angle eased a bit. Gradually the ridge line formed. This we followed for a bit before it rose more steeply again up to another ridge line. 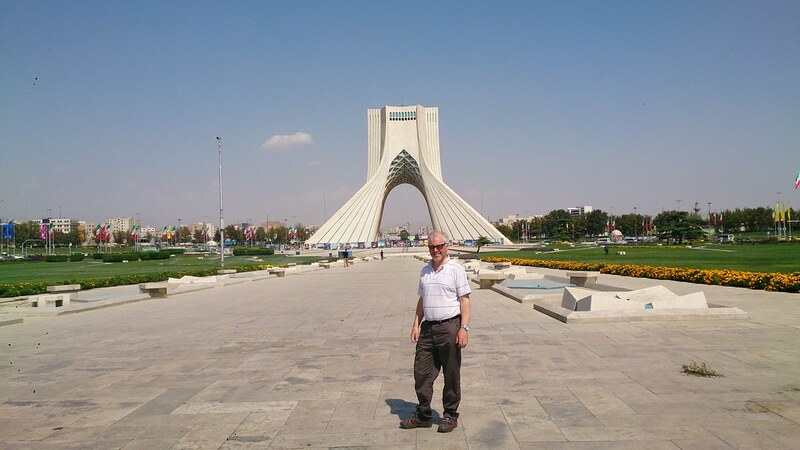 We had been going only 30 minutes or so but we had a rest and re-hydrated with a stupendous view over Tehran. Here is a short video clip at our stop. Arrvind and Neil arrived a little after the rest of us. We started off again. It was warm again. The gradient steepened once more. We could see another shelter up ahead, arriving there 50 minutes after our previous stop. There is a sad story behind the construction of this shelter. This is the Amiri shelter at around 3,480m. It was constructed by the family of a young climber who had died of exposure near this point. By now Arrvind and Neil were some way behind. We could see Arrvind but not Neil. Inside, the shelter was a decent size and the building had thick walls. Certainly a sound shelter in poor weather. We left just before Arrvind arrived. We could now see Neil below. But the two of them each had one of the young guides with them. After this point I had to put in effort to keep up with the other four plus Mehti. Eventually, two or three minutes from our next rest stop I dropped back. This final stop was at about 3,700m. I had a nice stop here. We could see the buildings on the summit from here. I let the others start off before me. I stuffed an energy gel into my mouth and followed 3 minutes behind. Now, on the final broad ridge, the reason we had come to Iran came into view. There 40 miles to the east rose Mount Damavand. I got myself into a good rhythm and followed the others. By 11am I was at the top, a couple of minutes behind the leading group. It was beautiful and still. Here I am. And here is a video clip at the summit. And no, Phil is not doing what you might think he is doing! I had a well-deserved drink. Rob and I shared out some Jelly Babies, Arrvind arrived 15 minutes later and then we generally festered allowing the altitude to do the necessary to our red blood cell count. We were up there around 1hr 45 minutes. We sunbathed. It was probably the warmest I had ever been at around 4,000m. We took in the views. Here is one to the west. The mountain is at the edge of a ski area. In fact there is a ski lift that takes you to about 30 minutes’ walk of the summit. There are a couple of buildings on the top. One seemed to be some sort of monitoring station and was not accessible. The other (the orange one) was a shelter, quite large inside really. Damavand drew the eye, but waves of dry ragged peaks ranged around to the north and north-west. To the north but unseen to us lay the Caspian Sea. It is the moist air from that direction that deposits copious amounts of snow on these mountains in winter. But now, in August, the snow line was well over 4,000m so that only a few of the peaks had much snow on them. Shortly before we left, Neil struggled to the top with his guide and someone else they had picked up en route. He looked spent – but a heroic effort. He would rest a while so as to assist with acclimatisation. So off we went. We just had one brief stop on the way down, by the Amiri shelter. The way down was as hot and dusty as the way up. In fact there was not much in the way of flora and fauna. Here are some flowers that were trying to survive in the harsh environment. We heard some distant sheep and saw an occasional bird. But that was about it. Soon we were looking down again at the Shirpala shelter. And we were back around 2.45pm. So, in the light of the stops, a relatively quick (and unremarkable) descent. I was quite dehydrated by this time. The guides found us some welcome non-alcoholic beer with peach flavouring. I spent some time on the terrace writing up my log. Eventually Neil came into view and was back with the rest by 5pm – in time for dinner at 6pm. The view was better than before. The pollution over Tehran had gone and the city was spread out below me in the evening sun, the sun setting at around 8pm. The evening meal comprised salad, vegetable soup and a lamb stew with rice. Very acceptable. So it was off to bed with the first phase of our trip nearly over. Tomorrow would see us on the way to Damavand.